This might just be the best cheesecake you’ve ever tasted. 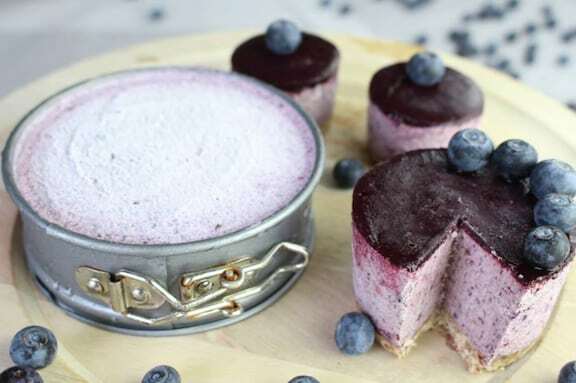 Rich with nuts and flavored with summer blueberries, you won’t believe that this is a raw, vegan dessert. Other than the 20 minutes of prep time, there are about 4 hours of freezing time. Recipe and photo by Laura Marquis, from Sweets in the Raw: Naturally Healthy Desserts, reprinted by permission. This might just be the best cheesecake you’ve ever tasted. Rich with nuts and flavored with summer blueberries, you won’t believe that this is a raw, vegan dessert. Crust: Process all ingredients until graham cracker-like consistency in the food processor. Firmly press crust mixture into the base of two small springform or 12 mini cheesecake molds. Set aside. Filling:Process all ingredients into a smooth, even consistency in the food processor or blender. Evenly spread the filling onto the base. Set aside in the freezer. Glaze: Process all ingredients into a smooth, even consistency in the food processor or blender. Evenly spread onto cheesecakes. Place in the freezer for 2 to 4 hours to firm up, then cut into wedges to serve. Laura Marquis owns a fitness studio in San Diego and blogs at Naturally Healthy Desserts.